This body of work discusses identity and the need to communicate or showcase facets of a personality to others. 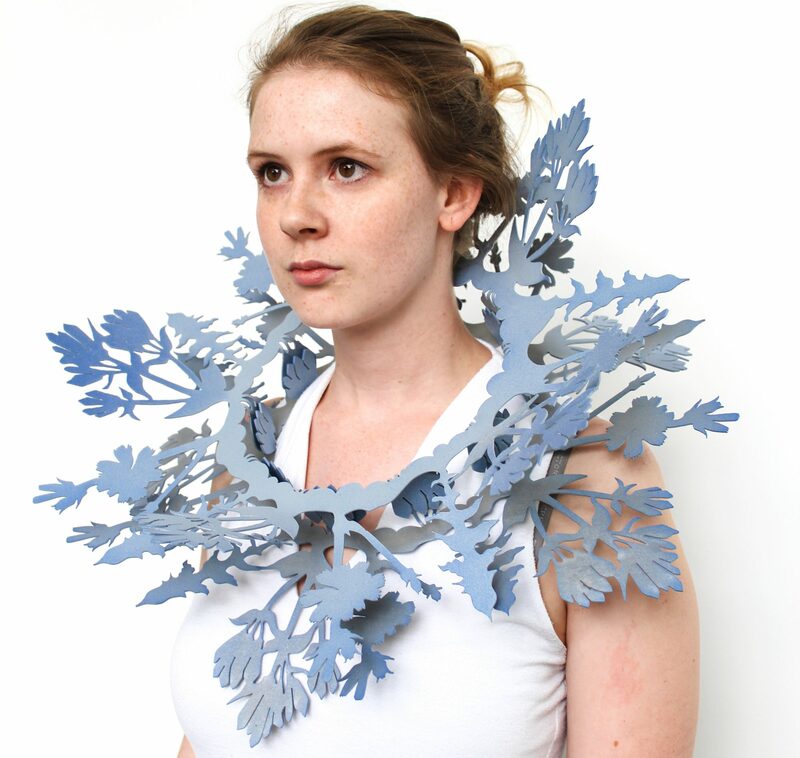 Due to the complexity of identity and this desire to ensure public awareness of it, the purpose of the pieces are twofold: while one chooses to own and wear each elaborate piece because of the visual and theoretical content that they hold dear, they also desire to own and wear the work to ensure others’ understanding of this identity. This raises the question, is identity personal or projected? Is it only important if others can digest it accurately? And is the projection of interests more important than the interests themselves? Each functional yet sculptural jewelry piece creates a personal habitat for the wearer, surrounding them with an imitation of the natural world that they are drawn to. Each piece is a collage, pieced together from specific wildflowers and plants. The individual plant species come together to create patterns, making the work quite decorative and more open for imagination. This is reflected and supported through the use of decals reminiscent of wallpaper that accompany each piece. The scale of the jewelry along with this abstraction of the visual content through grouped composition function to create a spectacle. This spectacle attracts attention from the viewer, but also keeps said viewer at a distance. The wearer desires to be noticed, while simultaneously distancing themselves from close contact with others, additionally choosing which areas of their body to highlight or hide through the strategic format of whatever piece they choose to wear. The show’s title What I Lived For is an appropriated portion of a chapter title in Henry David Thoreau’s Walden. It is in this chapter that Thoreau proclaims “ I went to the woods because I wished to live deliberately, to front only the essential facts of life, and see if I could not learn what it had to teach, and not, when I came to die, discover that I had not lived” (p. 56). This famous statement is quoted often, as it captures the yearning to connect to nature that so many people express. The quote’s popularity becomes ironic, as such desires are not typically acted upon; it is often the sentiment behind the idea or the projection of this yearning that fills a person’s need. The title therefore underlines the irony of what is otherwise a body of beautiful, oversized art jewelry pieces. It is not always practical to venture out into the woods, as one typically finds that a true encounter with nature can be uncomfortable, nor would the wearer of this work ever choose to adventure into those woods while donning any of these statement pieces. Instead it is the construction of a person’s identity that is transmitted in each piece, full of valid importance yet void of practical application.